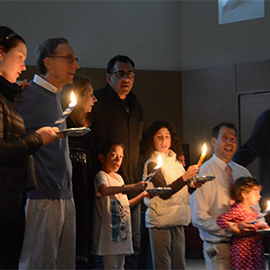 The Talmud teaches “Kol Yisrael arevim zeh b’zeh” – “all Jews are responsible for one another.” In keeping with that value, Leo Baeck Temple has long embraced the conviction that members who are financially able should be counted upon to help those of our members who are less able to afford membership. Sustaining Tzedek at LBT maintains our egalitarian community, where no one is denied the opportunities of temple membership because of monetary difficulties. A pledge to Sustaining Tzedek is made above your standard membership contribution. Suggested donation levels are: $18,000; $13,000; $10,000; $5,000; $3,500; $1,500; $720 and $360. To print and fill out a pdf / hardcopy donation form please follow this LINK.